Don’t forget to remember this – The Irish Times – Wed, Mar 30, 2011. REMEMBER A NAME but can’t match it with a face? Good with numbers but useless at childhood recollections? Led by Prof Shane O’Mara of Trinity College, Memory Lab is a month-long experience at Science Gallery in Trinity College, which invites the public to take part in a range of scientific experiments aimed at examining how our memory works. There has been a dramatic collapse in house prices in many parts of the world, including Ireland, which has seen prices come down by 40% or so on average since the peak a few years ago (and more to come, according to some economists). The market is now very slow-moving, and probably as bad as it ever has been. And given past patterns, will probably take a decade to recover. Jonah Lehrer has a fantastic post on the pervasive phenomenon of loss aversion in human cognition which must underpin at least some of the problems in the market, because of the aversion and indeed pain caused by recognising losses quickly. The U.S. is preparing for the outbreak of an unusual Asian disease, which is expected to kill 600 people. Two alternative programs to combat the disease have been proposed. Assume that the exact scientific estimates of the consequences of the programs are as follows: If program A is adopted, 200 people will be saved. If program B is adopted, there is a one-third probability that 600 people will be saved and a two-thirds probability that no people will be saved. Which of the two programs would you favor? The U.S. is preparing for the outbreak of an unusual Asian disease, which is expected to kill 600 people. Two alternative programs to combat the disease have been proposed. Assume that the exact scientific estimates of the consequences of the programs are as follows: If program C is adopted, 400 people will die. If program D is adopted, there is a one-third probability that nobody will dies and a two-thirds probability that 600 people will die. Which of the two programs would you favor? When the scenario was described in terms of deaths instead of survivors, physicians reversed their previous decision. Only 22 percent voted for option C, while 78 percent of them opted for option D, the risky strategy. Most doctors were now acting just like Frank: they were rejecting a guaranteed gain in order to partake in a questionable gamble. Of course, this is a ridiculous shift in preference. The two different questions examine identical dilemmas; saving one third of the population is the same as losing two thirds. And yet, doctors reacted very differently depending on how the question was framed. When the possible outcomes were stated in terms of deaths – this is the “loss frame” – physicians were suddenly eager to take chances. They were so determined to avoid any alternative associated with a loss that they were willing to risk losing everything. The same irrational quirk is now playing out in the U.S. housing market. Look, for instance, a 2001 paper by the economists Christopher Mayer and David Genesove. They studied the Boston condominium market of the early 1990s, which was one of the most spectacular real estate busts in recent decades. Between 1989 and 1992, Boston condo prices fell by nearly 40 percent. This meant that, for the vast majority of condo owners, they could only sell their home at a steep loss. Classical economics assumes that people will adjust to the new reality. They’ll realize that the market has changed, and that they made a costly mistake. But that’s not what happened. In their paper, “Loss Aversion and Seller Behavior: Evidence From the Housing Market,” Mayer and Genesove found that, for essentially identical condos, people who had bought at the peak of the market (between 1989-1992) listed their properties for nearly 35 percent more than those who had bought after the collapse. Why? Because they couldn’t bear to take a loss. The end result, of course, is that these overpriced properties just sat there, piling up like unwanted inventory. According to the economists, less than 25 percent of the properties bought during the condo bubble sold in less than 180 days. I’d argue that the same thing is happening right now, except on a nationwide scale. 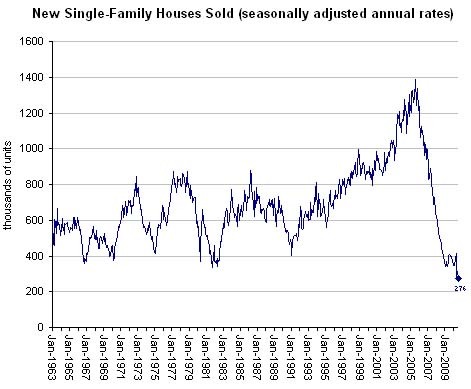 The housing market will only recover when we get over our collective bias, and realize that home prices have fallen and aren’t coming back (at least not anytime soon). Our irrationality got us into this mess – we binged on credit cards and took out unreasonable loans and mistook a bubble for a boom – and the only way we’re going to get out of it is to see through a new set of irrational quirks, which prevent us from fully equilibrating to our new financial reality. Sometimes, the wisest thing to do is cut our losses and run. Something that is worth noting. There is a lot of high profile Irish research on schizophrenia (see this and this, for example). Please feel free to pass this on to anyone you like – friends, colleagues, students. We already have heard of APS members making these papers required readings as a part of their Fall classes. Thanks to Current Directions Editor Randy Engel for commissioning what will surely become a classic set of reviews. How did the 10% myth get started? One clue leads back about a century to psychologist William James, who once wrote that he doubted that average persons achieve more than about 10% of their intellectual potential. Although James talked in terms of underdeveloped potential, a slew of positive thinking gurus transformed “10% of our capacity” into “10% of our brain.”5 In addition, in calling a huge percentage of the human brain “silent cortex,” early investigators may have fostered the mistaken impression that what scientists now call “association cortex” — which is vitally important for language and abstract thinking — had no function. In a similar vein, early researchers’ admissions that they didn’t know what 90% of the brain did probably fueled the myth that it does nothing. Finally, although one frequently hears claims that Albert Einstein once explained his own brilliance by reference to 10% myth, there’s no evidence that he ever uttered such a statement. You could lots more to this list: having a stroke is not consequence free, for example. Losing part of your brain is generally irrevocable, and requires lots of rehabilitation (unless you are Lisbeth Salander of course, in which case all will be well, even after being shot in several parts of your brain simultaneously!). The rest of the list is at the link above. At the age of 17 he began dissecting corpses from the church graveyard. Between the years 1508 and 1512 he painted the ceiling of the Sistine Chapel in Rome. Michelangelo Buonarroti—known by his first name the world over as the singular artistic genius, sculptor and architect—was also an anatomist, a secret he concealed by destroying almost all of his anatomical sketches and notes. Now, 500 years after he drew them, his hidden anatomical illustrations have been found—painted on the ceiling of the Sistine Chapel, cleverly concealed from the eyes of Pope Julius II and countless religious worshipers, historians, and art lovers for centuries—inside the body of God.This is the conclusion of Ian Suk and Rafael Tamargo, in their paper in the May 2010 issue of the scientific journal Neurosurgery. “Concealed Neuroanatomy in Michelangelo’s Separation of Light From Darkness in the Sistine Chapel,” by Ian Suk and Rafael J. Tamargo in Neurosurgery, Vol. 66, No. 5, pp. 851-861.